There has long been talk of a big screen reboot of Todd McFarlane's comic book character from hell, Spawn, and all eyes are on McFarlane himself, who owns the rights to the character and therefore holds the cards when it comes to Spawn's future movie potential. Rumors of a sequel to the 1997 film, which starred Michael Jai White in the lead, were circulating for years and were later succeeded by serious talk of a reboot - and there have been quite a few reasons to get excited about such a movie. First of all, White has said that he'd like to reprise his role in a reboot, which would definitely be good news for those who enjoyed his performance in the original. 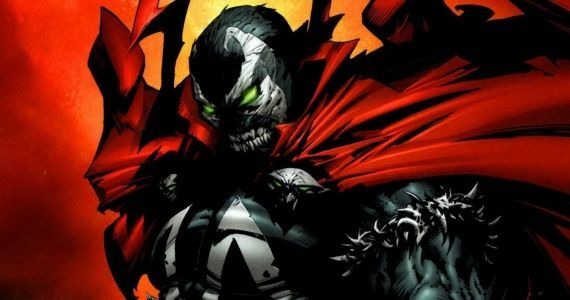 McFarlane has also said that he wants to make Spawn as a legitimately creepy horror movie rather than as a superhero movie, which would make an interesting contrast to the more lighthearted, action-based fare on offer. 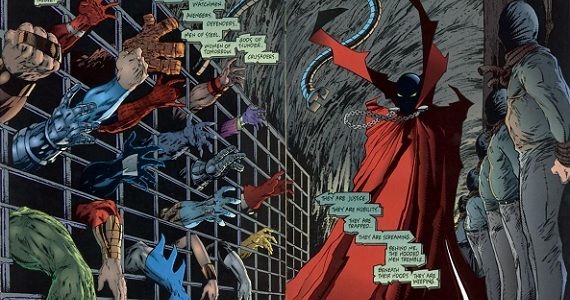 As the Screen Rant editorial team discussed on the most recent SR Underground podcast, McFarlane recently revealed that he's attempting to finish the script for Spawn by the end of the year in order to get it into production by 2014, which could potentially mean a Spawn movie would be in theaters by 2015. While that rough plan doesn't appear to have changed, what we're hearing about this movie is starting to raise quite a few concerns. "Fans always ask and the answer is always the same; the movie has been sitting in my head for 10 years. I've begun the screenplay, people have been bugging me about this thing forever... The only reason it’s always been slowed up is that I write, produce, direct and so I just need to get the proper amount of time to be able to finish that screenplay and then be able to do the rewrites whether it’s me or somebody else [who does them] and then go in and direct it. "I'm about a third through the screenplay. The whole movie is built on index cards so I just got to convert it onto the paper but I got like two hundred scenes, you can’t even have that many in a movie... There’s a couple of people that have kind of put a gun to my head and said we want that screenplay no later than December so that we can start shooting next year. So that’s right now [where we’re at] I've talked to my people and told them, 'you gotta find me the time. I gotta get this thing done by December so that we can start shooting by next year. Maybe shoot it up here in Canada.'" McFarlane's description of people "bugging" him and being forced to write the screenplay for Spawn with a metaphorical gun to his head doesn't bode well for those hoping to see the reboot begin shooting by 2014. If he truly does intend to write, produce and direct Spawn, then juggling all three roles and pushing the movie through development and production is going to take a lot of drive and determination. If McFarlane's ability to write the script for Spawn is dependent upon other people clearing a space in his schedule for him, it's difficult to see how he might manage the demands associated with the actual production of a film. The desire to take on writing, producing and directing a film all at the same time is understandable, since this would theoretically mean the maximum amount of creative control over the finished product. There are some writer-producer-directors who have managed to pull off this exhausting triad of roles successfully - but since McFarlane has never directed a feature film before and has only a handful of executive producer credits, his insistence upon making Spawn this way could potentially be disastrous for the movie. "At the San Diego Con, Jamie Foxx came out and they were doing an interview and [he said] ‘I make a good Spawn, right? I met with Todd and I want to do Spawn.’ And I was like, ‘I thought we were keeping that [quiet].'" "No, no, no, I'm just saying he said it out loud and then all of a sudden all the studios were phoning me again saying, ‘Todd, see if we can even get somebody in there.'" "My goal to some degree is to self-finance and I know [people] go, ‘that’s dumb and that’s crazy,’ but years ago, Mel Gibson did it with 'The Passion of The Christ.' So I sort of call this one, Spawn from hell: my passion of the anti-Christ. In my mind I can do this thing with 10 million bucks and if you keep it small they’re just gonna get an unknown director anyway for that kind of a budget, so I go, ‘If you’re going to get an unknown director, let me be that unknown director.’ Again, there’s nobody that’s argued it - they just go, ‘Then where’s the screenplay? Get it done.’"
One of the golden rules in Hollywood is to never spend your own money making a movie, because doing so means that you'll be personally stuck with the bill if it flops; although, given McFarlane's success, he can probably afford to take a hit of a few million dollars. His rationale for wanting to direct Spawn himself is a lot shakier, though; an unknown director is not the same thing as an inexperienced director, and even with such a small budget, it would be perfectly possible to find a talented director with a couple of indie horror movies under his or her belt. McFarlane went on to cite Crash (which Paul Haggis wrote, produced and directed) as a critically successful low-budget movie and The Conjuring as a commercially successful low-budget horror, both of which he believes show a precedent that proved Spawn could do well. It's worth remembering, though, that Gibson, Haggis and James Wan all had previous experience as directors. "Do I think I can get some A-list people in the movie? Absolutely! The A-list people have friends that are also A-listers. So if I can hit that deadline in December then we can go into production [and] it'll be a real movie. Even if its quote-unquote low-budget so that I can direct it, it will be a real movie." It's a shame that there's not more in McFarlane's words to inspire positivity. Hard-bitten cynics that we are, it's hard to swallow his plan to write, produce, direct and self-finance a Spawn reboot when after 10 years he's struggling to even finish the script (he can barely even draw part of a comic book in ninth months these days). It's all the more frustrating knowing that Jamie Foxx is enthusiastically up for the role and that studios are apparently eager to get the gears moving on this movie by next year - perhaps with a significantly higher budget than $10 million. Do you have faith that Spawn is going to become a "real movie" in the near future? Tell us what you think of McFarlane's plans in the comments. We'll keep you updated on the Spawn reboot as more information becomes available.